The representatives from Australia, the People's Republic of Bangladesh, Brunei Darussalam, Kingdom of Cambodia, the People's Republic of China, the Republic of India, the Republic of Indonesia, the Islamic Republic of Iran, Japan, the Republic of Kazakhstan, the Kyrgyz Republic, the Lao People's Democratic Republic, Malaysia, Mongolia, the Union of Myanmar, the Kingdom of Nepal, the Islamic Republic of Pakistan, the Republic of the Philippines, the Republic of Korea, the Republic of Singapore, the Democratic Socialist Republic of Sri Lanka, the Republic of Tajikistan, the Kingdom of Thailand, Turkmenistan, the Republic of Uzbekistan, the Socialist Republic of Vietnam held a meeting at Boao, Hainan Province, the People's Republic of China (the “PRC”) and formally declared the establishment of Boao Forum for Asia (BFA) on February 27, 2001. According to the resolution endorsed by the Board Meeting and approved by the members General Assembly respectively in 2006 and 2016, Israel, New Zealand and Maldives have been approved to become the BFA Initial Countries, thus the total number of the BFA Initial Countries reaching 29. 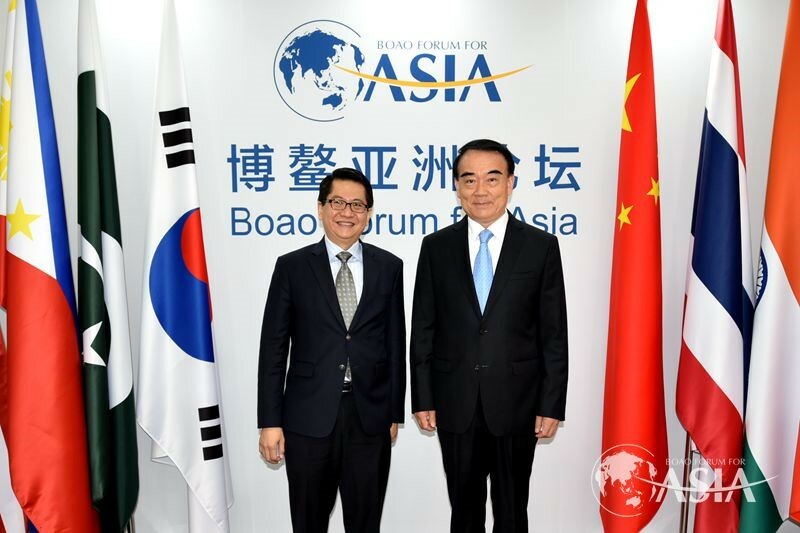 The Charter is prepared in accordance with the principles set forth in the Declaration on Boao Forum for Asia and the Guidelines for the Charter of Boao Forum for Asia. 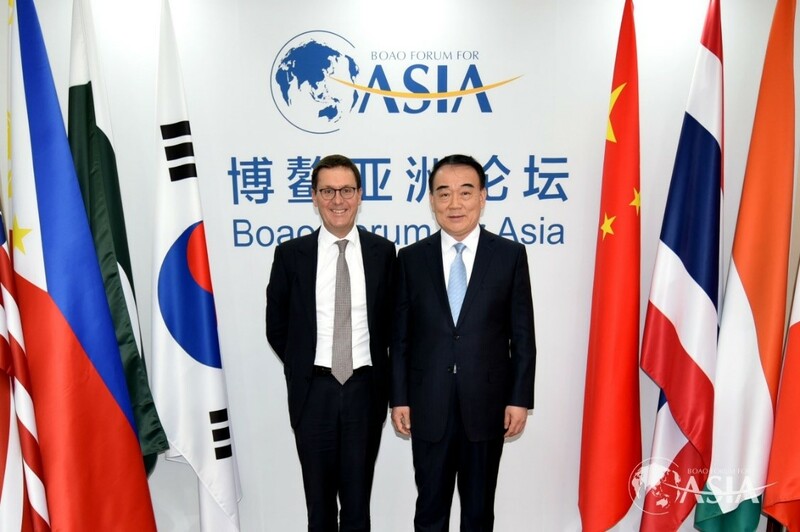 The name of the organization shall be Boao Forum for Asia (“BFA”). BFA shall be a non-government and non-profit international organization with a permanent principal location and shall hold meetings on a regular basis. 1. 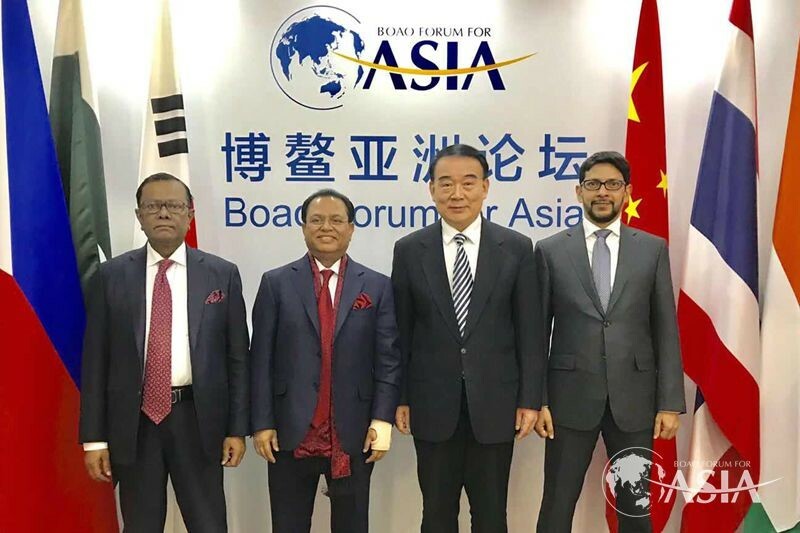 BFA shall be Asia-based so as to promote and strengthen economic exchanges, interaction and cooperation within the region, as well as between the region and other parts of the world. 2. BFA shall provide a high-level venue for dialogue between leaders from government, private enterprise, academia and other juridical associations to discuss, exchange and develop ideas in the scope of economic, social, environmental and related issues. 3. BFA shall facilitate the cooperation between its members, partners and supporting parties through its established networks. BFA shall comply with the Constitution and applicable laws and regulations of the People’s Republic of China and shall respect local social customs and ethics. 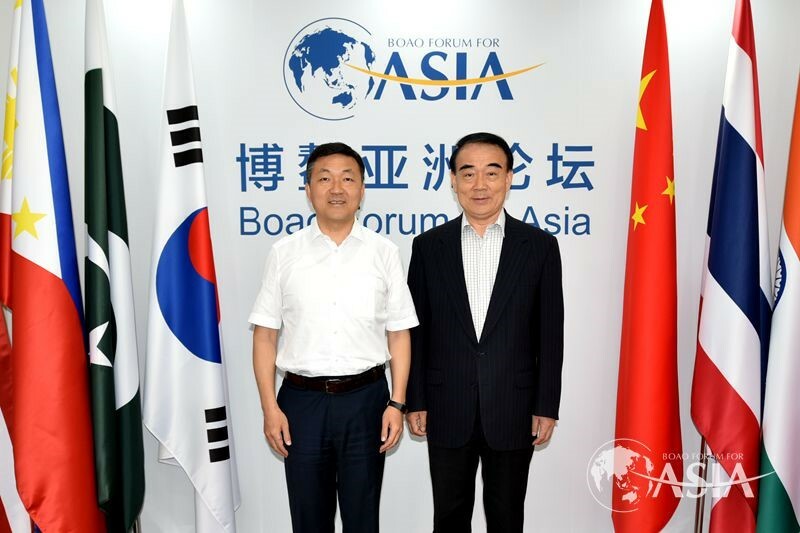 The headquarters of BFA shall be permanently located at Boao, Hainan Province, PRC. BFA's registered address shall be 1 Gold Coast Boulevard, Boao, Qionghai City, Hainan Province, PRC. 7. To pursue, independently or in collaboration with others, such undertakings as conference and exhibition management, information exchange, economic analysis, personnel training and e-commerce, etc., in pursuit of the overall goals of BFA. 1. There shall be two categories of Memberships, namely Full Membership and Partial Membership. Full Membership includes Initial Members, Honorary Members, Diamond Members and Platinum Members. Partial Membership includes Ordinary Members and Temporary Members. 2. Initial Members are former state/government leaders, prominent public figures, or non-profit organizations nominated by each of the 29 BFA Initial Countries within its allotted representation (two for each country). 3. Honorary Members are individuals, enterprises and organizations who have made substantial and outstanding contributions to the establishment of BFA. 4. Diamond and Platinum Members are individuals, corporations and organizations whose applications have been approved for participation in all BFA events including decision-making. 5. Ordinary Members are individuals, corporations and organizations whose applications have been approved for participation in BFA annual conferences and other events. 6. Temporary Members are individuals, corporations and organizations whose applications have been approved for participation in BFA annual conferences and other events on single event basis. 4. Be willing to perform the obligations of membership in BFA. All applications for membership in BFA shall be processed in accordance with procedures prescribed by BFA. (15) Such other rights as shall be determined by the Board of Directors. However, appropriate level of service fee will be charged if the members enjoy the rights as listed from (7) to (10). (7) Such other rights as shall be determined by the Board of Directors. (2)Other rights as stipulated by relevant policies of the said event. 7. Such other obligations as shall be determined by the Board of Directors. 1. All members are entitled to withdraw their membership. 2. In the event that a member decides to withdraw from BFA, the member shall deliver written notice to the Secretary-General of BFA at least two months prior to the date of withdrawal. The associated membership shall be considered terminated upon receipt of written confirmation from the BFA Secretariat, informing the member of the acceptance of the member’s withdrawal. 3. Membership withdrawal shall be conducted according to specific procedure as set forth from Boao Forum for Asia Rules and Regulations on Membership. Upon approval by the Board of Directors, the BFA secretariat shall reserve the right to terminate any individual membership based on evidence of a member’s involvement in lawbreaking activities, fiduciary neglect or other acts considered harmful or detrimental to BFA, its mission, or partners. The Secretariat also reserves the right to terminate membership for failure on the part of the member to communicate with BFA for a period of more than two years. However such Member shall be entitled to prior notice. The membership fees shall not be refunded. 1. The General Meeting of Members (“the GMM”) is the ultimate authority of BFA. The GMM shall be held once every calendar year. The BFA Secretariat shall be responsible for preparation and arrangements for the GMM. All Members shall be notified in advance concerning the agenda of the GMM. 2. Inability to send notice of the GMM, or, the non-receipt of such notice due to force majeure by anyone or more members, or, the absence of one or more members from the GMM shall not adversely affect the proceedings of that meeting, provided the members in attendance constitute a quorum. (5) Consider written motions presented and signed by at least one-fourth of the Full Members. Motions shall be submitted to the Secretariat at least two weeks prior to the date on which the GMM is to be held. 4. Resolutions of the GMM shall require the approval of more than half of the Full Members at the GMM. 5. The Chair of the Board of Directors shall be the Chair of the GMM. In the Chair’s absence, the Vice-Chair or any other member of the Board of Directors designated by the Chair may serve as Chair of the GMM. There shall also be a number of Co-Chairs from the Full Members. 1. The quorum required for each GMM is constituted by two-thirds of the Full Members. 2. Each Full Member has one vote at the GMM, or, Extraordinary General Meeting of Members of BFA. Voting will take place by a show of hands or by secret ballot, upon request by at least three Full Members or a member of the Board of Directors. Voting by proxy shall be allowed in accordance with the rules prescribed by the GMM. The Board of Directors, upon the written request of at least one-fourth of the Full Members, shall convene an Extraordinary General Meeting of Members for the purpose of deliberating any urgent matter that cannot be deferred until the next GMM. 1. The Board of Directors shall be the supreme executive body of the GMM and shall be responsible to the GMM. 2. The members of the Board of Directors shall be elected by a simple majority of the Full Members at the GMM. 3. A meeting of the Board of Directors shall be held at least once a year coinciding with the GMM at the headquarters of BFA. 4. Upon the request of at least three Board Members and approved by a majority of Board members, the Chair of the Board may call for a Special Meeting of the Board. 1. The Board of Directors shall consist of nineteen members. The first Board of directors will have a term of five years and later Boards of Directors will have a term of three years. All members of the Board of Directors are eligible for only one re-election. In the election of its Board members, due consideration shall be given to the need to maintain continuity in BFA's policy direction and in the pursuit of its vision. 2. 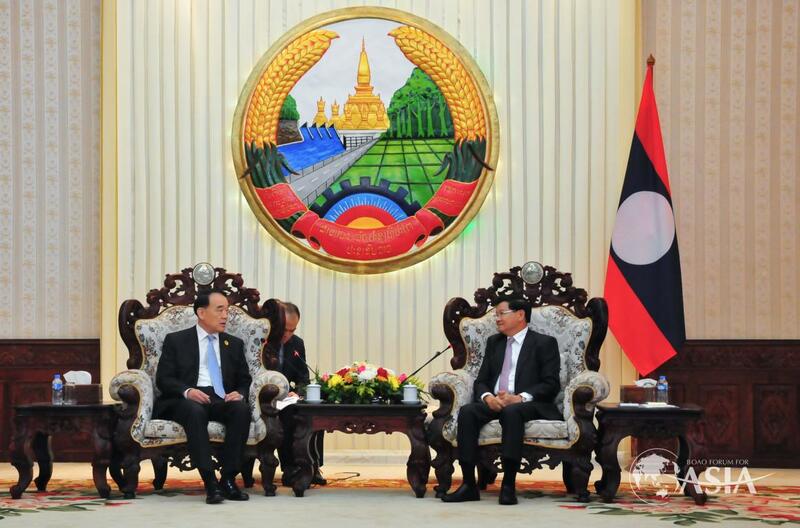 Seventeen directors shall be elected from among former senior government officials, scholars, business leaders and other eminent persons in Asia and around the world. 3. The chief representative to BFA designated by the host country and the Secretary-General shall be ex-officio members of the Board of Directors. 4. Due consideration shall be given to geographical balance in the composition of the Board of Directors and no more than four members of the Board of Directors shall come from or represent the same country/economy. 1. There shall be a Chair and a Vice-Chair of the Board of Directors. 2. The Chair and Vice-Chair shall be elected by at least two-thirds of the Members of the Board of Directors in a meeting of the Board. The election of the Chair shall follow a principle of balanced distribution among geographic areas. 3. The Vice-Chair shall be the chief representative to BFA of the host country. 4. The Chair and Vice Chair for the first Board shall serve a term of five years and shall be eligible for re-election. The Future Chair and Vice Chair will have a term of three years. 5.Should the Chair be unable to perform his/her duties as Chair, the Vice-Chair shall serve as acting Chair until the next Board meeting, at which time a new Chair shall be elected to fulfill the remaining term. 6. To execute any policy, act or duty delegated by the GMM. Unless otherwise stipulated in the Charter and relevant rules and regulations, any resolution of the Board of Directors shall require approval by a simple majority of the members present at a meeting of the Board of Directors, and come into effect thereupon. Each member of the Board has one vote. The Board of Directors reserves the right to pass resolutions on urgent and important matters in a non-meeting pattern. 6. To perform other functions as designated by the Board of Directors. 3. To perform other functions as designated by the Board of Directors. 9. To assist the Chair in discharging his/her duties. The Secretary-General is the legal person representative, chief executive officer of BFA and head of the Secretariat. The first Secretary-General will have a term of five years and later Secretary-Generals will have a term of three years, which may be extended by the Board of Directors for another term but in no case, for more than two terms. 6. The execution of any other activities that may be entrusted by the Board of Directors. There shall be a number of Deputy Secretary-Generals as decided by the Board of Directors. The Deputies should be nominated by the Secretary-General and appointed or dismissed by the Board of Directors. If nominated by other members of the Board, confirmation from the Secretary General shall be obtained before it is submitted to the Board of Directors for approval. The Deputies shall serve a term of 5 years with the possibility of extension by the Board of Directors. 3. Such other tasks as delegated by the Secretary-General. 4. Conviction by a competent court for a criminal offence. 5. To establish a virtual network` and a clearinghouse for other research and training institutes in Asia and elsewhere. The head of the RTI shall be nominated by the Secretary-General and shall be approved by the Board. 1. There shall be a Council of Advisors, consisting of nineteen members, to be elected by the Board of Directors from among former active members of the Board of Directors and other eminent persons in their respective fields of endeavor. The Council of Advisors shall elect a Chair from among themselves and such number of vice-chairs as they may deem necessary. Members of the Council shall have a term of three years, eligible for reelection for another term but in no case to exceed two terms. 2. The Council of Advisors shall meet during the Annual Conference of BFA or as the need arises to provide advice and suggestions on significant questions, issues and other matters related to the affairs of BFA. 3. The members of the Council of Advisors shall serve without compensation. However, expenses related to the performance of their functions shall be paid by BFA in the manner and to the extent determined by the Secretariat. 4. Members of the Council of Advisors shall be invited to the Annual Conference of BFA. All the funds of BFA shall be used pursuant to BFA’s mission and shall be in line with the business scope set forth in this Charter and related regulations. 1. BFA shall comply with internationally accepted accounting principles and accounting rules of the host country, and shall ensure that the financial books and records are legal, accurate and complete. 2. Each year there shall be an audit of the BFA accounts by an internationally recognized auditing firm. 3. Insurance, welfare and other employment benefits of BFA staff shall be in compliance with applicable regulations of the host country. 1. Any amendment to the Charter shall be submitted by the Secretariat to the Board of Directors for their review and shall be approved by the GMM. 2. Amendments to the Charter shall come into effect upon adoption by the GMM and filing to the Ministry of Civil Affairs for record. 3. Registrar of the host country shall be informed of the resolution of the GMM. Prior to the dissolution of BFA, a liquidation committee shall be established, in compliance with international practice and applicable laws and regulations of the host country, for the purpose of liquidating all of the assets and liabilities of BFA. Residual assets, if any, after payment of all debts and refund of membership fees, shall be contributed to, or disposed of in activities related to the vision of BFA under the supervision of the Registrar. Matters not specified in this Charter will be formulated in relevant rules and regulations. After its adoption by the Board of Directors, the rules and regulations shall come into effect. The official working languages of BFA shall be English and Chinese. The authority to interpret provisions of the Charter shall rest upon the Board of Directors. This Charter was approved by the GMM of BFA at Boao, Hainan Province, PRC on April 9, 2018.